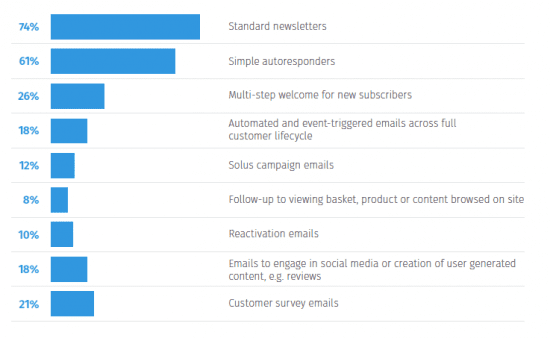 Chart of the Day: What is the most popular type of email marketing communication? In email marketing, there are so many different ways to communicate with your client. But which are the most popular? And if they are popular, does that mean they are correct? In today’s chart, it is unsurprising that most use newsletters at 74%. This is a simple way of keeping clients up to date with news or content and has been an email marketing standard for many years. However, some simple additions to your communications strategy could make dramatic differences. For instance, having a multi-step automation for new subscribers/customers, reactivation emails and automated triggers through a client’s lifecycle require a bit maintenance, but only 26%, 10% and 18% of the users surveyed actually use these in their strategy. It’s always good to know what others are doing in their strategy, but is it the right path for your company? Not necessarily. You need to lead the way in order to attract customers, so don’t be sheep when it comes to your email marketing strategy. The research was designed by the teams at Smart Insights and GetResponse and written by Dave Chaffey and Robert Jones at Smart Insights, so includes not only useful benchmarks for you to compare your performance against, but also our trademark visual mindtools to help you review your approach and take practical actions to improve results. View the full report Email Marketing & Marketing Automation Excellence 2017. Statistics help us turn data into information, allowing us to make informed and rational decisions and that’s exactly the purpose of this article. We’re huge fans of search engine marketing, but not everyone believes in its potential for growing a business, either through Search Engine Optimisation or Paid Search Marketing – which means an AdWords focus in many countries. What is the overall volume of search? If people can’t properly navigate or find the information they need on your website, you’re unlikely to convert their visit into a sale. 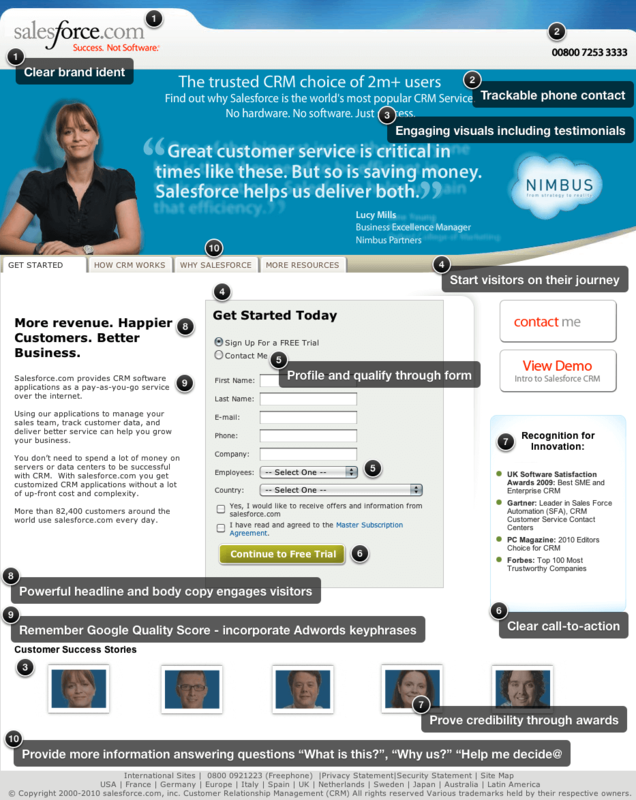 Gina Jones explains how to use website design and user experience to influence customers and drive sales. This article is part of BusinessZone’s Winning On The Web campaign in association with .com. For more advice on how to succeed online and meet our Winning On The Web Champions, click here. As acquiring traffic becomes more expensive, ensuring your website offers an outstanding user experience is essential. Web behemoths like Amazon and Google spend millions each year on user experience testing because they know that it can directly affect their bottom line. Studies have shown that even just a one second delay in page response can result in a 7% reduction in conversions; if an e-commerce site is making $100,000 per day, a 1 second page delay could potentially cost that company $2.5 million in lost sales every year. Quite simply, user experience is what happens to your users when they interact with your business online. It includes everything they see, hear and do, as well as their emotional reactions. If your website doesn’t offer what they are looking for, customers will simply click elsewhere, usually to a competitor’s site. 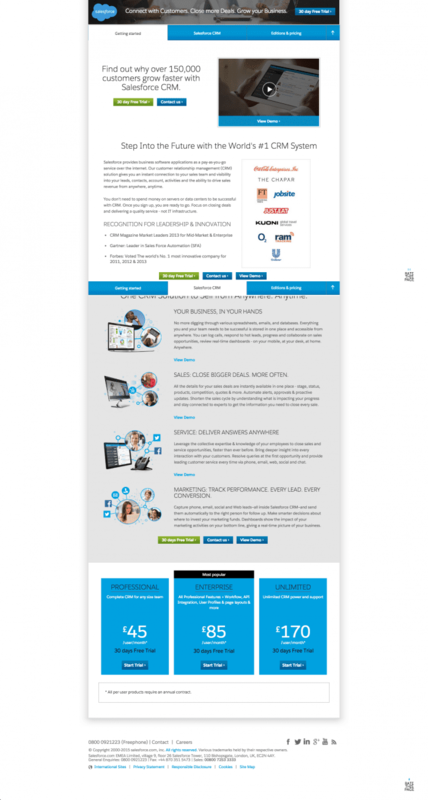 “It’s essential that the user journey is as simple as possible. Your website is often the first touchpoint, so it must be appealing in both looks and content,” says Tamara Heber-Percey, co-founder of online hotel experts Mr & Mrs Smith and Winning On The Web Champion. Why do I need Video and Audio on my Website? More and more online marketers and business owners are seeing the light and recognising the tremendous benefits of incorporating multimedia into their online marketing strategy. It’s a proven fact that multimedia more easily and effectively captivates your audience and grab’s the attention of your prospects, visitors, subscribers and customers. Time and time again research has shown that using multimedia in the form of video and/or audio advertisements increases conversation rates, buy rates as well as subscription rates for a product or service. If studies consistently show the advantage of incorporating multimedia into your online marketing campaign, then those who have not yet added multimedia to their advertising need to seriously rethink and reinvent their marketing strategy. In order to really appreciate the tips below, you’ll benefit from a little information on color psychology. Color psychology is the science of how color affects human behavior. Color psychology actually is a branch of the broader field of behavioral psychology. Suffice it to say that it’s a pretty complicated field. Some skeptics are even dismissive of the whole field of color psychology, due to the difficulty of testing theories. My own research on the topic, as this article conveys, lacks scientific evidence to back up every claim. But that alone is no reason to dismiss the profound and unarguable effect that color has on people.